I discovered this band last week, and have since dived into all of their releases. My personal ‘Best of’ would include Surefire, I’m Afraid, Stay With Me, T.D.M., You Don’t Know What It’s Like, All That You Are, and tons of others. Econoline Crush is based in Vancouver. Apart from Nine Inch Nails or Oasis, right now there isn’t another band I’d rather see in concert more than these guys. The chorus in each song is pure awesome and I’d love to hear them at a live show. 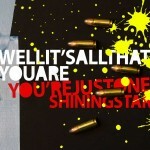 On the real cover for Surefire: The Best of Econoline Crush, the bullets are long, pointed and silver. I know these rounded gold ones look puny in comparison, but they are the only bullets I had on hand.